Eurotard 13738 this blouse comes with full shawl collar and left side is collar is pleated. 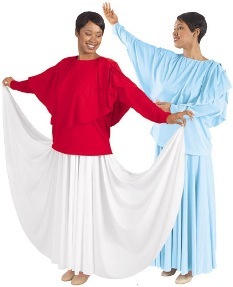 A unique top for Praise / Liturgical / Worship / Mime / Spiritual Dance wardrobe. Shown with Eurotard Triple Panel Skirt (EU 13674),and Eurotard Character Shoes (EU 75),sold separately.